Hi, I am interested in your 1930 Ford Model A (stock #1308-NSH) listed on Autotrader for $18,995. I'd like to get more information about this vehicle and confirm its availability. 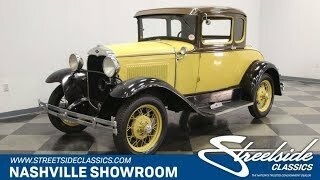 If you are a fan of the Model A, or thinking about becoming one, you should check out this car. These cars are fun for multiple reasons. They are an important part of American automotive history, and even though they are over 80 years old, they are fun to drive and can easily cruise around at 40-45 miles per hour. Plus, there are lots of other A enthusiasts out there so there is plenty of opportunity to become involved in club and social events if you wish. This car is a nice driver and a great way to get involved. Check it out. Henry Fords son Edsel did a nice job updating the styling on these cars with features like crowned fenders and a variety of styles and colors offered. This car was repainted some time ago, probably in the 60s and still looks good, but is showing its age a bit. The Yellow gives the car a fun, cheery look and it works well with the Brown on the cab and the Black fenders. The upright grill with separate headlights perched on a support that runs across the front from fender to fender is classic A. The side of the hood is full of louvers and a chrome band runs up and over the cowling. Out back is everybodys favorite part, the rumble seat. Everybody wants to ride in a rumble seat! The spare tire mounts on the back of the car and yellow wire wheels along with simple chrome bumpers complete the look. Open the door and you will find a Tan and Brown interior that is the perfect compliment to the yellow and brown paint. The cab is upright and easy to step into and out of. The bench seat has been nicely reupholstered in pleated cloth and both looks good and is really comfortable. There is a big round 4-spoke steering wheel and three pedals on the floor, although the gas pedal looks more like a gas button. The dash has a polished center panel that is about as simple as it gets with an ignition switch, amp meter and speedometer along a fuel level gauge that is actually adjustable for accuracy. Wouldnt that be nice! The shift lever for the 3-speed manual transmission rises from the floor with the emergency brake next to it. The cab is nicely trimmed out with a full headliner and carpets as well as a rear window shade. Open up the hood and you will find a stock 4-cylinder engine with an added battery shutoff switch. As would be expected, simplicity is the operative word here too. Exposed spark plugs and wires look cool, but dont reach out for them while the car is running! There is a generator and a starter and a distributor with one interesting twist. It has driver adjustable timing for easy start up. The water pump has been replaced fairly recently to keep things running cool. Power flows back through that 3-speed transmission to the rear axle located by long trailing arms with a single transverse leaf spring. The front axle is solid, also sprung by a single leaf, and the drum brakes at all four wheels were a tremendous advance over the old transmission brake on the Model T and 5-lug wire wheels keep things rolling. This car has been well maintained and is super solid underneath. Come on down and check out this fun part of American automotive history. And bring someone with you who has always wanted to ride in a rumble seat.